Marketing experts at Farotech offer 3 creative answers to the question of how to get more patients into your dental practice. Whether you have only been in business for a matter of months or your practice goes back several generations, the continuing question remains the same: how to get more patients into your dental practice. When you look online, it seems as though the answers to this question are actually endless and pointing in all different directions. How do you know which ones are worth your time and which ones you’re better off avoiding? At Farotech, we’ve spent over ten years asking and answering this question as we have specialized in online marketing for practices like yours. Rather than leaving yourself to trial and error, we have compiled three important tips that will definitely help you to connect with patients today. 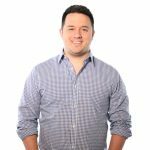 Any advice about how to get more patients into your dental practice will begin with the virtues of search engine optimization. Integrating strategic keywords into the content of your website, and then updating this content regularly, you boost your practice’s visibility on major search engines. Although you should keep search engine algorithms in mind, your true audience for that content should be potential patients. Write creative, informative, and useful blogs that your current and future patients will actually benefit from. When visitors see that you are providing a useful tool instead of just a marketing scheme, your credibility in their eyes increases. A good deal of marketing advice focuses on how to get patients to land on your website. But that’s not really the goal, is it? What you actually want to know is how to get more patients into your dental practice. This is where the Call to Action comes in. From your website, the biggest goal that you have is to get the potential client to either call or contact you via email. You need to make that connection. So, you need to let them know what to do. Placing calls to action on each page gives visitors a clear and easy step to take to get the information they need and give you the opportunity to create a more personal connection. Still, the ultimate goal of marketing isn’t to get that phone call or email any more than it is to get a visitor on your webpage. 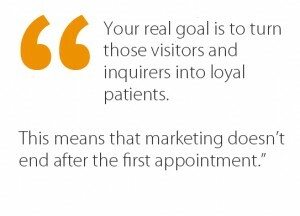 Your real goal is to turn those visitors and inquirers into loyal patients. This means that marketing doesn’t end after the first appointment. It is imperative that you continue to follow up with clients. Send them a survey about their experience. Ask them to leave a review. After a procedure, call to make sure everything feels alright. These practices continue to build the relationship between patient and dentist, ensuring that it will last for years to come. If you want to know more about how to implement any of these tips mentioned above, or want more marketing help for your dental practice, contact Farotech today. One of our marketing experts would be delighted to talk with you about how to improve your practice’s visibility and create the connections with patients you really need. Call us at 267.387.6620.